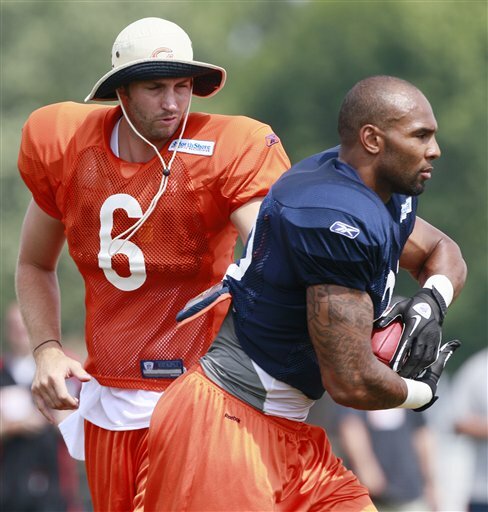 Jay Cutler and Matt Forte look to rebound from season ending injuries in 2011. Bears receiver Devin Hester warms up during a training session. 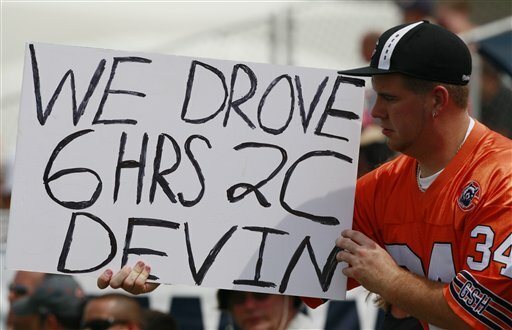 Bears fans travel far and wide to see their beloved team. Gear up for the Chicago Bears as they open up their 2012 training camp in Bourbonnais this week. Last year the labor dispute disrupted the team’s usual timetable; but this year everything is back to normal. The team will gather on Tuesday, and will hold its first practice session Thursday at 2:30 p.m. Check the Bears website before you travel to the camp. Sometimes weather -- or the team -- may cancel that day’s workouts. Bring plenty of water, sunscreen and lawn chairs. There is very little shade and it’s usually quite hot out. There is a play area for young children. However, the practices may be rather boring for them and the weather can be pretty intense (in other words — they will be miserable). There are opportunities for older kids to get autographs and sometimes photos with the players. But remember, this is a working environment for the players. They will accommodate you when they can. There are plenty of signs around the town to point you in the right direction of the college. The Bears use more than one part of the facility. It’s free — what a bargain! With Bears single game ticket prices going up and tailgating in some parking lots up to $49 this is a good opportunity to see the team on the cheap. If you don’t want to drive down to camp but you still have the urge to see the team before the pre-season schedule, they offer Fan Fest at Soldier Field on Saturday, Aug 3rd at 7 p.m. There are several activities, but the two-hour practice is the main feature. There is an $8 admission fee. What can fans expect at camp? Basically, the team runs drills. They will work on special teams, generally at the beginning of the sessions. The first few practices are without pads so you will not see much hitting. What usually excite the fans are drills, like 7-on-7. That is when you will see Quarterback Jay Cutler work on passing plays with his new receiving targets, Brandon Marshall, rookie Alshon Jeffery, veterans Devin Hester and Earl Bennett. Fans will get to see Bears running back Matt Forte returning to action after getting his contract extension. There has been a sense of excitement about the offense this off-season. The play of the offensive line will be scrutinized throughout the camp, but mostly during the pre-season games. Keep an eye on Jason Campbell: Fans will be happy to see a proven veteran quarterback backing up Cutler. On the other side of the 7-on-7 drills is the Bears defense. Of course they are anchored by their two linebackers and perennial Pro-Bowlers, Brian Urlacher and Lance Briggs. Additionally, proven veterans Charles Tillman and Julius Peppers are part of the core — which many feel is showing its age. That is why top draft selection, Defensive End Shea McClellin from Boise State, will be one to watch. We’ll see how much time he plays with the second, and possibly the first, unit. McClellin’s progress may be a key to see how you may view new General Manager Phil Emery’s drafting skills. There will be plenty of players, veterans, draft picks and free agents to watch and see how they move, down or off the Bears roster. What is at stake this pre-season? The Bears were closing in on a playoff berth last year; then everything fell apart when they lost Cutler and Forte to injuries. It cost Jerry Angelo his job as GM. Now head coach Lovie Smith is in the final year of his contract and he knows his future may be determined this year. This training camp will be important for Smith to finalize a roster to go into the 2012 season and produce a winner. That is a big factor to watch when the Bears break camp in August and the regular season begins on Sunday, September 9th when they host top NFL draft pick Andrew Luck and the Indianapolis Colts. If you want to whet your appetite, checking out a day of Bear camp may just do that.